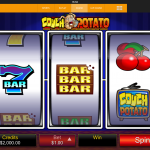 Couch Potato is a three reel, single pay line slot coming from Microgaming. This is a classic slot game with an interesting theme. We are all couch potatoes at some point, slacking in bed and watching TV all day long. This is an older slot with low level animations and visual details. Still the game theme is interesting and the slot can produce great payouts thanks to the rich pay table. 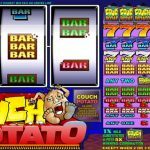 Compared to other classic slot games Couch Potato has a bit better features. There is no classic bonus game in the slot, but the Wild offers a big dose of excitement. He will substitute for all of the game symbols in the slot. 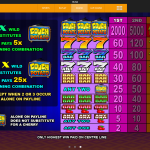 If a wild contributes in a winning combination he will add an x5 multiplier to the payout. If two wilds contribute to a winning combination at once the payout will be multiplied by x25. Thanks to this players can score big payouts even without hitting the top prize in the game. The wild has the highest payout in the slot which can be 2.000, 5.000 or 15.000 coins depending whether you are playing with 1, 2 or 3 coins per bet line. After the wild the highest payout in the slot comes from the Sevens symbol. The Red Seven awards a 180 coins payout, the Blue Seven awards a 150 coins payout, while the White Seven awards a 120 coins payout. After them the Triple Bars will award the highest payout with 90 coins, while any two wilds will award a 75 coins payout. The Double Bars award a 60 coins payout, while the Single Bars and Cherries award 30 coins. If you love classic but futuristic clots then you should consider playing Cosmic Cat a 3 reel slot by MicroGaming.